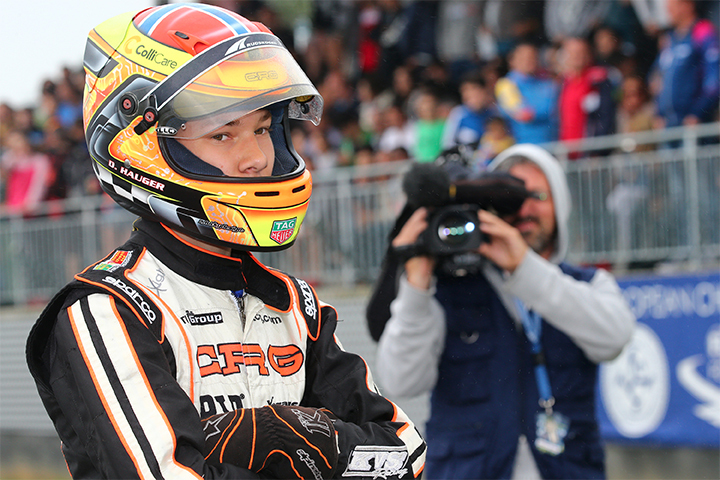 CRG Racing Team will resume its track duties in Le Mans for the fourth round of the CIK-FIA European Championship. The race will be the third round in the OK and OK-Junior campaigns following the races held in Sarno (Italy) and Oviedo (Spain), and the second for KZ2 after Genk’s opener (Belgium). In the other category – the most performing KZ, the European CIK-FIA 2017 title is already firmly in the hands of the CRG driver Paolo De Conto, who won the first three races held in Sarno, Genk and Oviedo gaining the mathematical certainty of claiming the title, when the closing round is still to be held in Kristianstad (Sweden) next July 30th. The victory scored by Paolo De Conto in Oviedo enriched CRG hall of fame in European Championships strengthening even further successful history of the Italian outfit that lasts for more than 30 years. The Circuit of Le Mans is the first crucial stage of the OK and OK-Junior campaign that reached the turning point of the season ahead of the closing rounds to be held in July in Finland and Sweden. Alike, KZ2 will run its second of three rounds in Le Mans waiting for the series closer in Sweden. CRG works team in OK will include Flavio Camponeschi, Dennis Hauger, Kilian Meyer, Hannes Janker, Michael Rosina and Callum Bradshaw, the latter will be back to racing after skipping the race of Oviedo due to some conflicting school commitments. The race in Le Mans is going to be a chance to counter-charge for CRG drivers after the positive performance shown in Spain but that was not eventually converted into a strong end result. Camponeschi, Hauger and Janker were hit by bad luck after a solid beginning of the weekend. In particular, Camponeschi had to retire with one lap to go when holding P3 and therefore has to credit with the good luck. In OK-Junior, CRG will be represented by Gabriel Bortoleto, who claimed the podium in Sarno, Luca Giardelli and Donar Munding, as well as by several drivers that will partake the event among the fields of CRG private teams like TB Racing Team and CRG Keijzer Racing. Despite Bortoleto could not get a positive result in Oviedo, the young Brazilian is still holding the fourth position in the classification at 30 points, which is 15 short of the classification leader, and therefore is among the main protagonists of the series. In KZ2, CRG works team will field Alessandro Giardelli and Enrico Prosperi. Both drivers will hunt for the first points in the Championship after the opener of Sarno, alongside other CRG drivers racing for private teams. All drivers will certainly try and put in a solid performance ahead of the closer of Kristianstad. Friday 30 June 2017: Free practice; Qualifying from 15:50; Heats from 18:35. Saturday 1 July 2017: Heats from 13:00. Sunday 11 June 2017: Qualifying at 10:00. Drivers presentation 12.45. Finals: 13:35 Academy; 14:15 KZ2; 15:05 OK-Junior;15:50 OK.